Fifty years ago pioneer Soviet spacewalker Alexey Leonov made his famous jump into the silence of outer space, overcoming his own biggest personal challenge and marking a significant step in the history of space exploration. The first spacewalk became an epic hero tale reported and hailed in every major newspaper in the world exactly five decades ego. “Russian floats in space for ten minutes; Leaves orbiting craft with a lifeline,” was the headline story featured in the New York Times half a century ago. “US officials salute latest Russian feat,” papers reported on March 18, 1965. But while it was another victory in the space race between two superpowers, for the man behind the accomplishment, Cosmonaut Alexey Leonov, it was a personal challenge. “For ten minutes Soviet Cosmonaut Alexey Arkhipovich Leonov drifted and spun through dreamlike gyrations while he followed the spaceship Voskhod II in its swift, elliptical path around the distant earth,” TIME Magazine wrote in its article in the March 1965 issue which featured Leonov on its cover. Spacewalks became a reality after the Soviet space program succeeded in developing the first pressurized spacesuit and created the first multi-person spacecraft, dubbed the Voskhod. While the Voskhod-1 mission took the first trio of cosmonauts into space, the real glory went to Voskhod-2′s Alexey Leonov, who on March 18, 1965, became the first person to free-float in space. But even 50 years later, Leonov still analyzes his first spacewalk and remembers that there were some potentially fatal errors that could have been avoided. The final moments before the first man walked out into space stretched on for over an hour. The flight control, Leonov remembers, would not clear his historic leap as he was waiting locked in his spacesuit. Once outside the spacecraft, the mission wasn’t without its drama. As Leonov recalls, his pressurized suit became bloated during float in zero gravity, making it impossible for him to reenter the capsule. 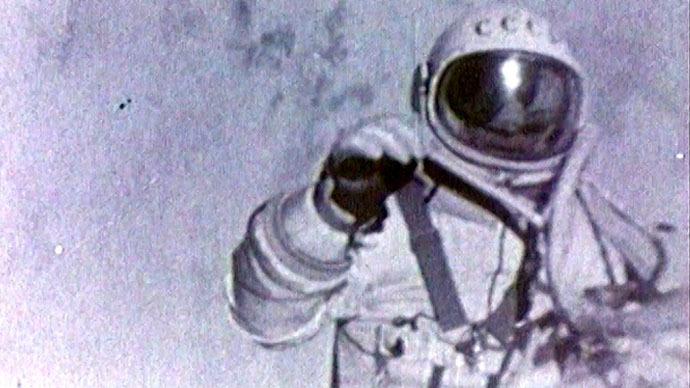 Over the course of a few tense minutes, Leonov let out the oxygen to depressurize his suit in order to squeeze back through a one-meter-wide airlock. The reliability of the spacesuit was the key issue to be tested during the historical journey.“The task then was purely more psychological. A spacesuit is a spaceship shrunk to the size of a human body. Then it was important to understand that it can save humans,”says Leonov. That is not however how the world viewed Leonov’s personal journey. Space euphoria and the lack of gravity painted everything at ease in the minds of journalist back on earth at the time. “Then, as easily and efficiently as he had emerged from his ship, Leonov climbed back inside,” TIME magazine wrote in 1965. Still, the experience of floating alongside his spacecraft was thrilling. The complete lack of sound in the vacuum of space is what moved the Russian Cosmonaut the most. The Voskhod-2 crew experienced many more troubles with oxygen and a dangerous re-entry malfunction, eventually landing at an unplanned location in the middle of thick Russian taiga forest, facing subzero temperatures, wolves, bears and a snowstorm outside. Welcomed back on earth as a hero, Leonov completed man’s first spacewalk, 10 weeks before the United States. Follow RT’s special coverage of Leonov’s historic spacewalk, which will continue into Thursday with a live feed from Moscow Museum of Cosmonautics featuring Leonov himself. RT will follow questions posted under hashtags #askacosmonaut or #спросикосмонавта, as well as those under RT’s Facebook post, and put some of them to Leonov.